Oops. 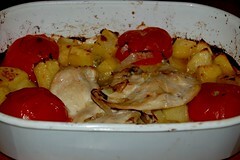 I chose this chicken dsh from my Taste & Create partner this month, High on the Hog. Unfortunately when I looked at the recipe more closely, I realised she had specified chicken breasts with skin and ribs, and all I had were a couple of thin, anaemic chicken supremes. Not only that, but with it being February my tomatoes were not the best (normally I boycott fresh tomatoes between October and May, but I made an exception for this). I’d been attracted to the recipe because it included lots of lemon, and I was shocked by Temperance saying she wasn’t a fan of lemon and meat. How can anyone not be a fan of lemons with practically anything, I wondered? So I persisted. As you can see from the photo, skinless chicken is not a good choice for this dish 🙂 It was good anyway, but would have been better with crispy skin and juicier chicken. It’s very similar to the Catalan way I do fish, so you could certainly substitute firm white fish of your choice (or swordfish or tuna) for the chicken. I think next time I would slice the potatoes rather than dicing them, so they’d cook more evenly — maybe my cubes were too big, but I had to cook them for longer than specified. I gave the chicken less time, because the pieces really were so thin, and I didn’t want them to dry out. they look good anyway.. and looks like it is easy to prepare, huh? lemon and meat’s gotta be good.